Could WrestleMania 35 be Brock Lesnar's last appearance in WWE for a while? We don't yet know how WWE's talks with Brock Lesnar over a new contract are going but there have been rumors of Lesnar possible leaving the WWE. In a recent interview, Dana White strongly hinted that Lesnar could return to the UFC in the summer. Brock Lesnar is set to defend the WWE Universal Championship against Seth Rollins at WrestleMania 35. Rumors suggest that Lesnar's current contract is up after WrestleMania. Brock Lesnar has been Universal Champion since beating Brock Lesnar the vacant title at WWE Crown Jewel in Saudi Arabia. "Brock Lesnar is doing his thing with WWE. 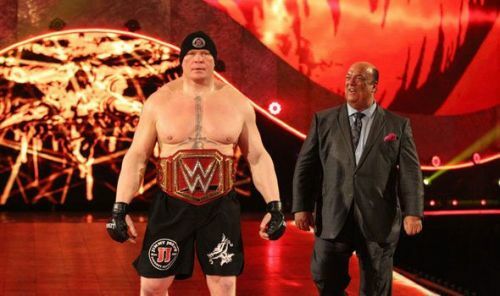 One of the things about Brock Lesnar is, when that guy is ready to fight, he is not shy. He will call me and he will let me know. To be honest with you, I'm hoping to hear from that guy this summer. I think both guys really want it, Cormier wants it bad. I know Cormier wants it bad, and Brock wants it bad. So, when two fighters want to fight each other as bad as these two do, I think it's going to happen." We don't yet know if Brock Lesnar will stay on with the WWE after WrestleMania 35. The Beast defends his title against Seth Rollins at the Grandest Stage of Them All. What's next for Brock Lesnar after WrestleMania 35?